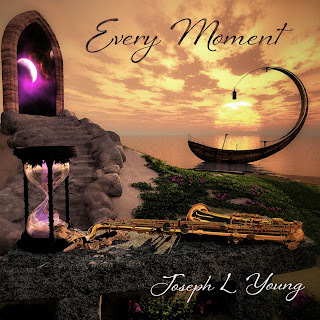 It has been a few years since I covered Joseph L. Young’s Ethereum album. The focus on that album was the flute, now we have the arrival of Every Moment at the end of March. This time around there is a focus more on the saxophone, however, the flute is mixed in as well. The many layers of instrumentation make the 12 tracks on this CD a delightful journey for the listener. I appreciated the mixture of all the instruments. The use of the synthesizer layered between the sax is brilliant. The atmospheres are a combination of new age and smooth jazz. I love that combination and most certainly would like to hear more. The variety is what draws me and keeps me interested. When I looked at all of the influences of this artist it was a clarification of why I enjoy his music so much. Many of the artists mentioned, were some that provided an introduction to jazz and new age music for me as well. Being pleased with a recording is acceptance. It is the first level of listening. I do not think you can go anywhere with the music unless you find commonality with it. For me, this was easy listening to Joseph’s offerings. The first thing is how you are stimulated by is the cover, which has many different meanings. It is placed before you to decide where you want it to take you. If Every Moment was precious to you and you felt grateful to be alive, don’t you think that your existence here on this earth would be more rewarding? So maybe this is what the artist is trying to say on the cover of the CD and in his music. I think the cover is a work of art and the music that follows is as well. Elements of world, Native American, jazz, new age, and chill are all part of the package on Every Moment. This album was a nice change from what I normally hear when listening to new age. It is very original and inventive. I hesitate to say unique but it definitely is an eclectic mix that I enjoyed from beginning to end. That is a major accomplishment for any artist to achieve with a listener. When you hear so much music all the time it becomes harder to find originality and a step away from the norm. For my ears that is a fact. A fine example of that kind of diversity I am referring to is the eleventh track (by no coincidence) titled “Eleventh Hour.” It starts off with a swirling synth emulating the wind then the track takes off and continues to evolve. With nearly 6 minutes of that sax mesmerizing you and the synth melting away your stress makes for a very interesting progressive composition that invites you to listen very carefully. It is more thought-provoking and energizing than meditative tracks, which many of the other tracks can be. This is what makes it all so intriguing, you never know what is coming next. Joseph L. Young gives us another masterpiece of sound and color to listen to. Just remember one thing, savor Every Moment of this gift of music and spirituality and thank Joseph when you can.